Okay, this heat has been ridiculous lately… it's basically devil-heat. It's just unnatural. So, being the baker that I am, I decided an ice cream cake was in order. Even though I was sweating like a five hundred pound trucker driving through Phoenix, the outcome was worth every second. Readers: "What if I don't have an ice cream maker, Kylie?" Me: "I've got you covered… this ice cream is a No Churn ice cream. Meaning you don't need to own an ice cream maker… you just need to have a freezer, which, I am 99% sure, is a standard household appliance." Okay… cheesy little convo aside, this ice cream recipe really is fantastic because it doesn't require an ice cream maker - which I've heard can be a hassle to use if you have a smaller freezer (I personally have a very slim, narrow freezer…so I know the frustration of having limited space). The blog title accurately describes this ice cream… it is SO good. The ice cream does call for rum, but I can assure you that you do not taste the rum at all… it is solely to help prevent your ice cream from crystallizing. "Where's all the rum gone?!" …. sorry, my nerd is showing - I couldn't resist a Captain Jack quote. In your mixing bowl (I used my kitchen aid, but if you just have a hand mixer, rock that business like a boss…), add the peppermint, rum, and condensed milk. 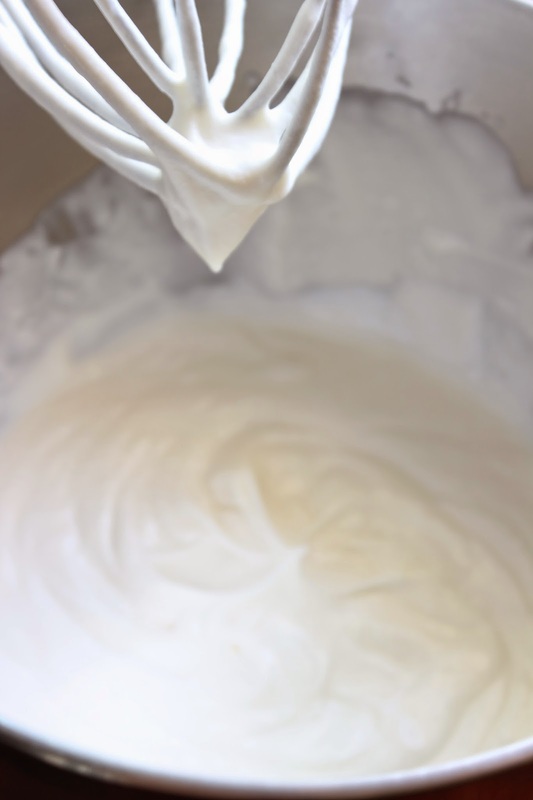 Add chilled whipping cream, and mix on medium-high until soft peaks form - do not over mix! Fold your chopped chocolate chunks into the cream base - I chopped the chocolate into varying sizes because I'm so fancy… I am so quote-y today… I apologize. I lined a spring form pan with cling film and poured the mixture in - I decided to use this method to ensure the ice cream would be the same shape and size as the cake… I like to keep things simple and easy. Freeze for at least 6 hours. I froze mine overnight, and it was slightly firm and soft… like ice cream you buy from the grocery store, perfectly scoop-able before it turns to an icicle after one night in your freezer… seriously, do grocery store freezers have magical powers? Sorry… nerdiness is showing again. I'll calm down, I promise. Once the ice cream was frozen and ready to go (Let it go! Let it gooooo…. can't hold it back anyyyyymorrreee! I am SO sorry… I apparently can't control myself today…) I cut the cake in half, plopped the ice cream in the middle… and voila! An ice cream cake! Doesn't that just look scrumptious! Try not to drool… it's hard I know, but give it your best…. Advice I want to impart concerning making this ice cream cake: don't do it all at once… sometimes I get way to gung-ho when I start baking and I forget I'm not super-baker. So, bake your cakes off first. While they're baking, remain aware of your time, but prep your ingredients for the ice cream - or you can prep, start ice cream and then do the cakes while the ice cream chills in the freezer… whatever suits your fancy. Once cakes are done and cooling, start on your ice cream - you want to pay full attention to your ice cream… my first batch curdled because I was doing three different things at once. In a mixing bowl, add all dry ingredients and mix until completely combined - then create a crater in middle of dry ingredients. In a separate mixing bowl, mix all the wet ingredients until completely combined. Pour wet mix into the crater of the dry ingredients. Mix together until you have a batter consistency. Grease three 8-inch round pans (I sprayed Pam) and dust with flour, tapping out excess flour. Divide batter evenly among pans, gently tap each pan against the counter. Bake for 20 minutes and rotate pans in oven. Continue to bake until toothpick comes out almost clean, about 12ish minutes - you want a few crumbs attached: crumbs equal perfection in cake-land. I allow my cakes to cool in the pans, leaving them out overnight covered with towels - it's how I've always cooled my cakes, and they're always yummy and moist. Add water, lemon juice, and strawberries to a saucepan over medium heat. Allow to sit for about 1-2 minutes, then stir strawberries. Stir often, and once mixture starts to look more liquid-y, add sugar 1/2 cup at a time. Stirring frequently, allow sauce to come to a boil. Turn heat down to a simmer. Mash strawberries. In a small bowl, add cornstarch. Add 2 teaspoons water, and mix until you get a thick paste. If too thick, add 1/2 teaspoon of water. Add cornstarch mixture to strawberry sauce, mix in completely. Allow sauce to sit and cool for a bit - about 10 minutes. Pour over cake… store the rest. Lick the spoon… I won't judge. Enjoy this ridiculously delicious cake!